Walking dogs is not only a passion for young Zimbabwean national Wesley Shingwe (28) it is a living. 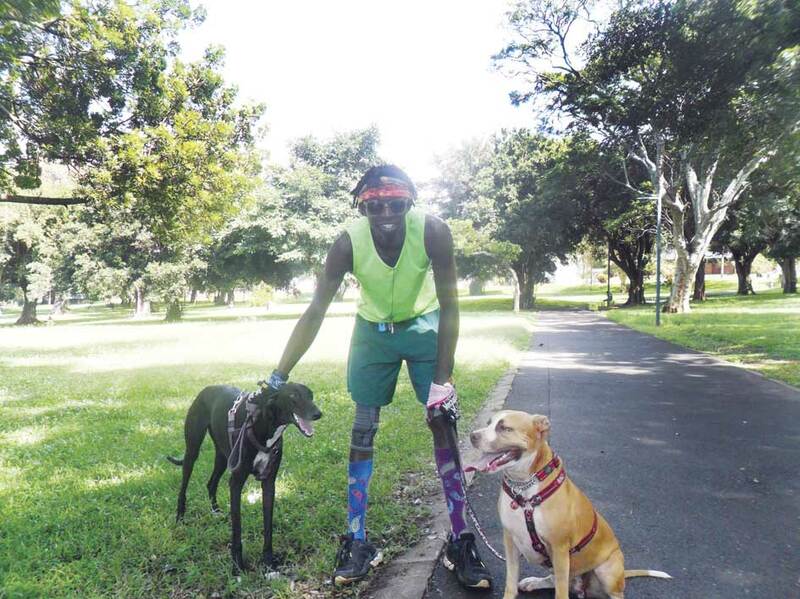 Shingwe has built his own clientele in the Glenwood area by walking dogs for people who don’t have time to do it. He came to South Africa in 2013 in search of a job, however, he found no permanent employment and survived just from one day jobs and by making art pieces which he sold on the road. “My passion for dogs started when I got my first real job as a housekeeper where my employer owned 10 dogs. That is when my love for the four legged creatures grew,” said Shingwe. He added that by taking care of 10 dogs and being around them every day, he learned a lot about their behaviour. “With the help from my ‘Irish mother’ Thelma, who is my only family here in this country, I was able to start a business through walking dogs. At first it came as an idea as I saw that many dogs are locked behind gates most of the day by their owners and giving them a walk during the day would be a great Idea just for them to get some fresh air and an exercise. I must say, it is not an easy job however, the job found me,” he said. Shingwe said Thelma was the one who pushed him in the right direction and she was the one who got him his first group of customers. Besides walking the dogs, he washes and grooms them and gives each dogs an hour walk. “My day starts at 6am in the morning till 6pm in the evening and on a daily basis I give eight walks. The most challenging thing about my job is when I walk the dogs on the road, people are scared. What people do not know is that it is very easy for a dog to sense that they are scared of them and that is when the dog also becomes scared then it attacks. People need to relax around animals. If an animal sees that you are relaxed it also relaxes,” he advised. Shingwe suggested that more people should consider dog walking as a career, especially those who have nothing to put bread and butter on the table. He said the Facebook post which went viral recently really brought in more business for him and he would like to thank the person who took the initiative to post about him.